A run on the Creek is a mad dash down angled hydraulics and through a blur of what seems like almost constant rock gardens. The average gradient is 105 feet per minute. At mile three, Mushroom rapid followed by Toadstool make for a thunderous adrenaline rush and Miracle Mile offers up an extreme descent of 200 feet per minute. Be aware of dangerous current flowing under large boulders and undercut rocks which make for extremely technical rapids. Both kayakers and boaters need to follow precise lines. Kayakers should have “an unfailingly quick offside roll” and there should be someone in the group who knows the lines by heart. Rafters need serious technical boat control and the ability both to self-rescue and pick up swimmers quickly. Cherry Creek is some of the most technical commercially-run white water in the United States. Expert groups sometimes run it privately, but most rafting trips on the creek are guided by professional river guides. 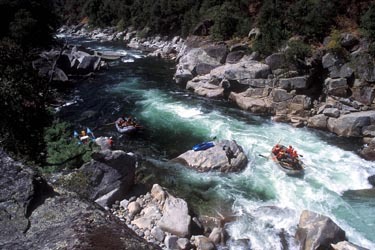 For kayakers, it is considered the gateway to California’s Class V boating scene. Because it runs all summer, and many Class V runs peter off after the spring snowmelt, Cherry Creek is the most popular Class V summer run in California. Kayakers have even been known to camp out at The Creek and run it daily. Every August there is an informal race on Cherry Creek. Kayakers “bomb down,” often in longer racing boats. This is not something to try unless you are an expert Cherry Creek kayaker!